This verse draws our attention to birds which, of all living creatures, are worthy of special consideration and observation. There are approximately ten thousand different species of birds, many of which have miraculous characteristics. Wherever we live, we may encounter many of these creatures and can admire the different aspects of each variety. They exhibit countless examples of the evidence of creation, through their aesthetic appearance, their perfect flying mechanisms, their expertise in migration, their nest-making skills and their self-sacrificing behavior. Meanwhile, other species of birds are created with a special aptitude for forming social groups. Many varieties live together as a community, warn one another of danger, work collectively to find food and shelter, and make various sacrifices to help each other out in any number of ways. (For detailed information, see Harun Yahya, Devotion Among Animals: Revealing the Work of God). As God pointed out in the Qur’an, these creatures are capable of establishing their own form of communication and performing in cooperative ways the duties inspired in them by God. Some birds distinguish themselves by their superior intelligence and special talents. These particular species are defined as birds that can imitate sounds, include the parrots, songbirds, and hummingbirds. Many of us have heard about, seen on television or even personally witnessed these birds’ ability to talk. However, we may not have considered what a great miracle it is that these creatures can mimic in this way, or to the perfection of the way in which God has created them. These creatures’ being hatched with their ability to talk or imitate sounds is one of the miracles of creation and, at the same time invalidates the claims of evolutionary theory. Talking, or even imitating sound, is not just a simple matter of opening and closing the mouth, as some people believe. A complex system is required for this action to take place, and all parts of this system must be synchronized in perfect working order. Birds with a talent for sound mimicry enjoy all of these requirements and demonstrate their ability in extraordinary ways. Some of these species have a talent rarely found in any other creature except man. The best example of this are parrots, which can imitate, in addition to human speech, a wide range of sounds that even humans can’t duplicate convincingly—for example, as the creaking of a door, the cap being removed from a bottle, a ringing telephone, or a tune being whistled. This talent to imitate, observable in parrots and some other bird species, is not an ability that can be acquired by coincidence. For any living creature to imitate a sound it has heard, it needs to have complex physiological structures already in place. Particularly in the case of birds that can closely imitate the human voice in terms of tone, stress and expression, these structures must be very sophisticated. For a bird to reproduce a word or a melody it has heard, it needs to have an appropriate physical structure. Its sense of hearing must be functioning perfectly, and it must be able to memorize the information received by the senses and the ability to conceptualize meaning in its own terms. 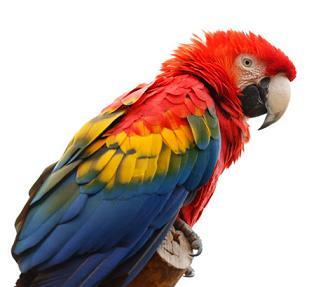 People are astonished the first time they hear a parrot say “Hello!” when the phone rings, ask “Who is it?” when the doorbell rings, or greet someone familiar by name. But even though it’s an astonishing achievement for a bird to say even one word, many don’t really give it due consideration. Over time, they may even come to see it as normal and commonplace. A bird possessing such talents is a great wonder of creation, for birds and other animals do not have free will and reason, and do not share the human characteristics of thought, the ability to make conscious decisions and the determination to carry them out. The ability to talk and imitate sounds is taught by God to certain species of birds. These creatures do not talk because of their own rational thought, will or consciousness, but through God’s inspiration. In a verse of the Qur’an, God conveys that He is supreme over all living creatures: “… There is no creature He does not hold by the forelock…” (Qur’an, 11:56) All the wondrous characteristics of birds that can imitate sounds are just part of the evidence God shows to man so we may witness the magnificence of His creation. You might assume that in order for a parrot to be able to imitate the human voice—to use a person’s same spoken words, stresses and pronunciation—they must possess a larynx whose structure is similar to a human’s. However, the structure of the human larynx bears no resemblance to these creatures’ physical structures. The larynx, vocal cords, tongue, lips, palate and teeth that humans use in speech are completely different in birds, and some do not exist at all. But even though all birds lack these structures, still these species can reproduce phrases spoken by humans—and in the same tones. If we consider that a person without a tongue is unable to speak or that we lose our voice if the vocal cords are damaged, it’s also worth considering that parrots, budgerigars, and mynahs, members of the crow family, have completely different physical characteristics which nevertheless enable them to talk in the same way as humans. Birds have no larynx similar to a human’s, but do have a special vocal organ, known as the syrinx, that enables them to produce sounds. In birds, air from the lungs passes through this organ. In a sense, the bird’s syrinx is the equivalent of our human larynx. One of the principal differences is that in humans, our vocal cords are positioned closer to the windpipe. So far, the fact that the bird’s syrinx is deep inside the body has prevented scientists from obtaining a complete answer as to how birds produce sound. Scientists have filmed birds using infra-red and x-ray cameras, and have made close studies of their song and speech by means of fiber-optic microscopes inserted in their throats. Yet we still cannot explain the physical process by which birds produce song and imitate sounds. The syrinx is located in a pouch within the clavicle below the bird’s throat. The membrane covering this pouch is sensitive to the air coming from the lungs, and its elasticity and complexity of the membrane are factors that determine the quality of sounds. The sound quality is also affected by the length of the windpipe, the constriction of the voice box, the neck muscles, structure of the beak, and their respective movements. In short, the complexity of the birds’ syrinx determines the complexity of the sounds they produce. Its muscles affect the air flow and consequently, the quality of the sound. In parrots, budgerigars, and some songbirds, the syrinx has a greater number of muscles, and its structure is more complex. Furthermore, the different techniques that parrots and budgerigars employ for imitating the human voice are most effective. Like humans, parrots have thick tongues that enable them to produce sounds resembling ours. Sound is produced by blowing air through two separate places in their syrinx, and at the same time producing the independent sounds required to produce consonants. The initial sound from the syrinx is shaped with the help of the throat, and then in the mouth with the tongue. In their research studies with grey parrots, Dianne Patterson and Irene Pepperberg reached important conclusions on vowel production: Due to the radically different anatomy of this parrot’s vocal organ, even though they lack teeth and lips, they can produce sounds that closely resemble sounds produced by humans.4 Indeed, parrots and budgerigars can quite clearly imitate sounds such as “m” and “b,” which we normally produce with the help of our lips. Budgerigars, however, due to their small size, are not able to use the same technique as parrots. Using their syrinx to create frequencies from 2,000 to 3,000 Hz, they then add on a second vibration. This system is known as frequency modulation or FM, the principle behind the AM (amplitude modulation) radios to be found in practically every home. These days, many FM broadcasting stations add low transmitters to their signals which, in common with normal signals, are adjustable through a transmitter, but are of a very high frequency. While the frequency of normal signals varies from 20 to 20,000 Hz, the frequency of many low transmitters starts at 56,000 Hz. The main reason for using the FM system is to offset the major disadvantage of the AM system—namely, the interference of many natural or man-made radio sounds, called “parasites.” Because the weak signals of AM radio are quieter than the stronger ones, differences in signal level are formed, which are then perceived as no! ise. AM receivers have no facility for cutting out these parasitic sounds. To solve this problem, Edwin H. Armstrong invented a system for eliminating noise caused by the power of the waves. Instead of changing the transmission signal or the strength of the transmitter, he changed the frequency of sound waves per second. Thanks to this system, the amplitude of noise (strength of sound waves) could be reduced to a minimum. But scientists are still mystified how budgerigars manage to use this same system. Of course, no little budgerigar can possibly work out for itself from the time it is hatched how to apply a series of principles discovered by man only after long trials. In the same way, no parrot can know that it must produce auxiliary sounds in order to make consonants distinct or to develop systems in its throat to enable it to do so. Also, it’s not possible for such a system to be the end product of a series of blind coincidences. All these complex systems are without doubt, the work of God, the Creator. Most humans, with their far superior intelligence, have difficulty in imitating other voices or speech while these little birds are able to imitate many sounds they have heard with perfection, showing how exceptionally skilled they are. Scientific research has concluded that this perfect mechanism in birds is a masterpiece of design. God’s supreme knowledge and art, as shown in the magnificence of His creation, is too evident to be obscured by deceitful theories. Swans, peacocks, brightly colored parrots, budgerigars and an infinite variety of living creatures invalidate any claims of coincidence and demonstrate the infinite power of the Lord, our Creator. Darwinists insist on trying to attribute this perfect system to coincidences. According to their mentality, all the living creatures we see around us, all the skills they possess, and all their aesthetics and beauty are products of blind chance. The truth is, it’s not possible to explain away the consciousness and design seen in all living creatures, at all times, with coincidences. It is purely because of ideology that Darwinists cannot see this evident reality—or rather, they do see it but won’t accept it. These people cling to evolutionary theory out of their belief that it explains the mechanism of life. Accepting that it cannot forces them to accept the only possible and true alternative explanation, which is the truth of creation. This results in the complete collapse of Darwinism and any related materialist ideologies.